Ever been curious about the technical mumbo-jumbo you can find people talking about? How about all the numerous parts you can find all over the internet. How are you to know which ones are good, and which ones are bad. What about trying to reach different goals, how exactly do you go about doing that? If only there was someone to help you with your build. Well, that's where we come in. We're not only here to build guns for people, but also to help people build their guns. Here, you can find definitions to different terms, different set ups that work different ways, how to achieve different goals, and many other questions you might have when starting out on upgrading your own gun. For example, below we have a version 3 gearbox out of a G36. While all gearboxes are a little different, they all have similar pieces and parts. 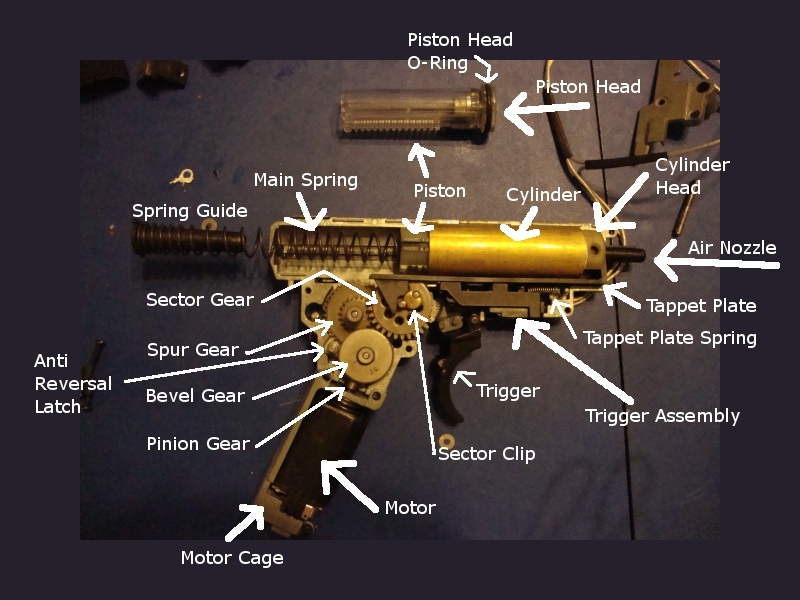 Here, I have most of those parts labeled.